"To be able to eat again without pain is the best gift I have received this year!" “Thank you so much for being patient with me and taking so much good care,” says Hazel F., a community member who lacks dental insurance. “You just don’t know what this means to me; to be able to eat again without pain is the best gift I have received this year!” exclaims Cody O., a young man who has not been to a dentist in over four years. Smiles for Everyone Foundation partnered with local non-profit organizations to help identify individuals in need to receive free dental care at this event. Along with Mid-Cumberland Community Action Agency, these non-profits included Stepping Stones Safe Haven, an organization that serves homeless women and children; Head Start, a support services organization; and Community Helpers of Rutherford County. Since 2011, Smiles for Everyone Foundation has delivered Smiles to over 16,000 individuals around the world, providing over $12 million in donated dentistry. The Foundation would like to thank all the volunteer providers and support staff who so kindly took time out of their lives to give back to those in need. Volunteer providers at the Nashville Day of Giving include Dr. Rachelle Fleury, Dr. Jennifer Gordon-Maloney, Dr. Charles Major, Jr. and Dr. Yewande Oye-Somefun. Smiles for Everyone Foundation and a team of volunteer providers and support staff are headed to their Paraguay International Outpost to conduct outreaches in the most vulnerable populations around Asunción next month. Please follow their website and social media outlets for more information about this trip and their other programs: website, LinkedIn, Facebook, Instagram and Twitter. The next Day of Giving will be held in Houston, TX, on July 28, 2018. 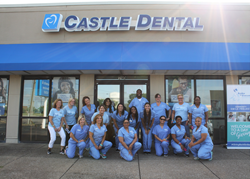 Castle Dental provides general dentistry, children’s dentistry and, in select locations, specialty care services such as orthodontics, oral surgery, periodontics and endodontics at 59 offices throughout Texas and Tennessee. Castle Dental is operated by dental groups that have affiliated with Smile Brands Inc., one of the largest providers of support services to dental groups in the United States. Smile Brands Inc. provides comprehensive business support services through exclusive long-term agreements with affiliated dental groups, so dentists can spend more time caring for their patients and less time on the administrative, marketing and financial aspects of operating a dental practice. Smile Brands is a portfolio company of Gryphon Investors (“Gryphon”), a leading middle-market private equity firm based in San Francisco, CA. For more information, visit http://www.castledental.com. The Smiles for Everyone Foundation is a 501(c)(3) nonprofit organization with the mission of delivering smiles for everyone by providing free dental care for those in need, both at home in the U.S. and around the world. Since 2011, the Smiles for Everyone Foundation has delivered over 16,000 smiles and $12 million in donated dentistry. The foundation currently supports programs that provide free dental care to those in need in Cambodia, Ghana, Laos, Nicaragua, Paraguay, Thailand and the United States. For more information or to make a donation, visit http://www.smilesforeveryone.org.